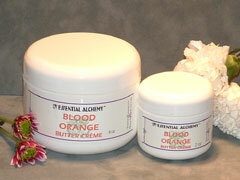 Listed below are our Essential Alchemy™ crèmes and lotions. All are "handcrafted" in small batches and are made with only natural ingredients with no chemical preservatives or alcohol. ALMOND BUTTER CRÈME - This crème is made with shea butter, almond oil, and bitter almond essential oil which makes it nourishing with a delightful almond scent. It's rich and emollient texture will make your skin feel soft and smell great. Ingredients: distilled water, fractionated coconut oil, almond oil, shea butter, coconut oil, beeswax, a natural vegetable based emulsifying wax, bitter almond essential oil, citric acid, and leucidal liquid. AMBER BUTTER CRÈME – This crème is incredibly emollient and delightfully scented. The amber resin used to scent this crème will subtly stay with you all day. Ingredients: distilled water, shea butter, coconut oil, beeswax, a natural vegetable based emulsifying wax, amber resin, citric acid, and leucidal liquid. BLOOD ORANGE BUTTER CRÈME - For those who like a citrus scent, the blood orange essential oil blended into this crème is one of the most fragrant and exotic citrus oils available. This crème is made with shea butter which provides deep nourishment for your skin. Ingredients: distilled water, fractionated coconut oil, shea butter, coconut oil, beeswax, a natural vegetable based emulsifying wax, blood orange essential oil, citric acid, and leucidal liquid. COCOA BUTTER CRÈME – This crème is suitable for use by the professional body worker or for daily use at home. Because of the natural chocolatey smell of cocoa butter, no scent is added to this creme. Ingredients: distilled water, fractionated coconut oil cocoa butter, coconut oil, beeswax, a natural vegetable based emulsifying wax, citric acid, and leucidal liquid. COCOA MINT BUTTER CRÈME– This crème is reminiscent of any chocolate/mint treat that you love. The cocoa scent is dreamy and the mint gives it a gentle tingle. Ingredients: distilled water, fractionated coconut oil, cocoa butter, coconut oil, beeswax, a natural vegetable based emulsifying wax, peppermint essential oil, citric acid, and leucidal liquid. DOUBLEMINT COCONUT CRÈME – This crème is "minty fresh" and is great for tired achy feet. The analgesic effects of the mint essential oils make this helpful for any sore muscles. It’s also great for use during the summer because of its cooling effects. A wonderful crème for the body worker to add to their practice. Ingredients: distilled water, fractionated coconut oil, coconut oil, beeswax, a natural vegetable based emulsifying wax, peppermint and spearmint essential oils, citric acid, and leucidal liquid. FRANGIPANI BUTTER CRÈME - This crème with it's exceptional texture and exotic floral scent will leave your skin toned and lightly scented all day. Ingredients: distilled water, fractionated coconut oil, shea butter, coconut oil, monoi de Tahiti, beeswax, a natural vegetable based emulsifying wax, frangipani absolute, citric acid, and leucidal liquid. GINGER SPICE CREME - The exceptional texture of this crème along with it's spicy scent will leave your skin feeling smooth and your mood uplifted. Ingredients: distilled water, fractionated coconut oil, coconut oil, beeswax, a natural vegetable based emulsifying wax, ginger, clove, and nutmeg essential oils, citric acid, and leucidal liquid. JASMINE BUTTER CRÈME – This crème is lightly scented with jasmine wax and jasmine absolute. If you like the smell of jasmine, you’ll love this. Ingredients: distilled water, fractionated coconut oil, shea butter, coconut oil, beeswax, a natural vegetable based emulsifying wax, jasmine wax, jasmine absolute, citric acid, and leucidal liquid. LAVENDER BUTTER CRÈME – This crème is made with shea butter which provides deep nourishment for your skin. The smooth floral scent of Bulgarian lavender is added. Ingredients: distilled water, fractionated coconut oil, shea butter, coconut oil, beeswax, a natural vegetable based emulsifying wax, Bulgarian lavender essential oil, citric acid, and leucidal liquid. LEMON OLIVE BUTTER CRÈME - This crème is made with extra virgin olive oil and lemon essential oil. It's rich and emollient texture will make your skin feel soft and smell great. Ingredients: distilled water, fractionated coconut oil, coconut oil, extra virgin olive oil beeswax, a natural vegetable based emulsifying wax, lemon essential oil, citric acid, and leucidal liquid. MARY JANE'S excellent HEMP BUTTER CRÈME - Made with hemp oil & patchouli mandarin, cedar atlas, & clove bud essential oil. It's rich and emollient texture will make your skin feel soft, smell great, and perhaps help you remember some good times. Ingredients: distilled water, fractionated coconut oil, coconut oil, shea butter, hemp oil, beeswax, a natural vegetable based emulsifying wax, citric acid, leucidal liquid, patchouli, mandarin, cedar atlas, and clove essential oils. MANGO BUTTER CRÈME – This crème is especially formulated for very dry cracked feet and hands, but can also be used on any other dry areas. For body workers, it is a nice addition for clients with troubled feet and it has a lovely fragrance. Ingredients: distilled water, fractionated coconut oil, almond oil, mango butter, coconut oil, beeswax, a natural vegetable based emulsifying wax, lavender, tea tree, myrrh, benzoin resin, tagettes, and calendula essential oils, with citric acid, and leucidal liquid. This luxurious crème using cocoa butter and coffee essential oil will moisturize your skin and wake you up at the same time! Ingredients: distilled water, fractionated coconut oil cocoa butter, coconut oil, beeswax, a natural vegetable based emulsifying wax, coffee essential oil, citric acid, and leucidal liquid. Enjoy the scent of the Caribbean with key lime and peppermint essential oils. This crème will moisturize and invigorate. Ingredients: distilled water, fractionated coconut oil, shea butter, coconut oil, beeswax, a natural vegetable based emulsifying wax, key lime and peppermint essential oils, citric acid, and leucidal liquid. This crème is delightfully rich and deliciously scented. Enjoy the warm maple/birch scent and nourish your skin with coconut oil and shea butter. Remember warming up on a cold winter day. Ingredients: distilled water, fractionated coconut oil, shea butter, coconut oil, beeswax, a natural vegetable based emulsifying wax, maple powder, maple extract, Adirondack birch essential oil, citric acid, and leucidal liquid. RED GRAPEFRUIT BUTTER CRÈME - This crème with it's exceptional texture and bright citrus scent will leave your skin feeling fresh and your mood uplifted. Ingredients: distilled water, fractionated coconut oil, coconut oil, beeswax, a natural vegetable based emulsifying wax, red grapefruit essential oil, citric acid, and leucidal liquid. VIRGIN COCONUT CRÈME – This crème is suitable for use by the professional body worker or for daily use at home. No scent is added. The virgin coconut oil gives it a very light and delicious natural coconut scent. Ingredients: distilled water, fractionated coconut oil, virgin coconut oil, coconut oil, beeswax, a natural vegetable based emulsifying wax, citric acid, and leucidal liquid. All our lotions are handcrafted in small batches. Our base lotion ingredients are distilled water, fractionated coconut oil, vegetable glycerin, a natural coconut emulisfier, citric acid, grapefruit seed extract, & leucidal liquid. Essential oils are added to create each scent & are listed below. All natural ingredients make for nourished & healthy skin.